Jalandhar: A Memorandum of Understanding (MoU) has been signed between the prestigious professional body of company secretaries, the Institute of Company Secretaries of India (ICSI), and Lovely Professional University (LPU), today, at LPU Campus. Following MoU, ICSI would facilitate the conduct of specialized training programme in LPU for faculty members, research scholars and students in areas of mutual interest by providing experts. LPU would also share the expertise of its faculty members as resource persons for training programmes or workshops organized by ICSI. Both explored the opportunity for starting a new MBA Programme in Legal Affairs & Governance. In addition, LPU will also facilitate CS qualified professionals to pursue PhD at LPU. Prior to this MoU, its President CS Makarand Lele had asked LPU for mutual co-operation and recognition of ‘Company Secretary’ as a qualification equivalent to Post Graduate degree for pursuing PhD programme at LPU. 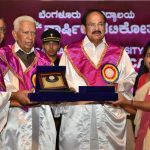 He also underlined that ICSI has a full-fledged Academic and Research Wing and encourages its members to undertake research. He also informed that 56 universities across the country are already recognizing CS degree for pursuing PhD. On the occasion of signing ceremony, Secretary ICSI, CS Ashok Kr Dixit; CS Satwinder Singh; CS Dinesh Gupta; CS Prof Vijay Gupta; CS Aman Setia; CS Pallavi were present from ICSI; whereas, from LPU Pro Chancellor Mrs Rashmi Mittal; Vice Chancellor Prof Dr Ramesh Kanwar; Executive Dean Dr Sanjay Modi; Senior Dean & Registrar Dr Monica Gulati; and, Dr Ramesh Thakur graced the memorable endeavour. Working jointly, both LPU and ICSI will also organize specialized programmes ‘Teacher Congruence’ and ‘Training of Trainers’ for mutual advantage. MoU will also lead to exemptions in university subjects for the students of ICSI in topics like corporate governance. Highlighting, with motto ‘Speak the Truth, Abide by Law’, ICSI is a statutory professional body under the jurisdiction of Ministry of Corporate Affairs, Government of India. With objective of promoting, regulating and developing the profession of company secretaries in India, it has four Regional offices in New Delhi, Mumbai, Kolkata, Chennai, and approximately 3,00,000+ students pursuing its CS programme.